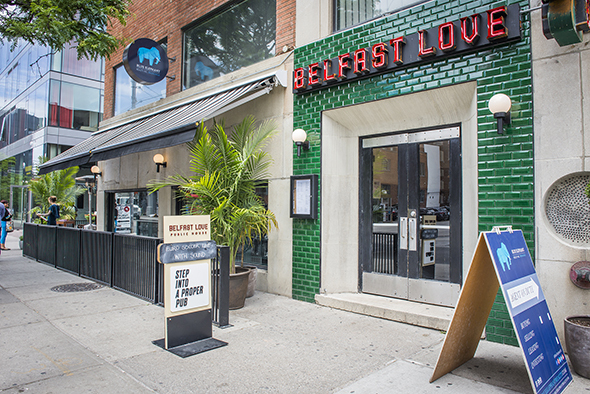 Belfast Love is an Irish pub, with an emphasis on the ish. Aside from the neon shamrock marking its entrance and a penchant for whisky, this public house is Irish only in spirit. It offers a sleek atmosphere and is peppered with quirky accents throughout. It's the first Toronto venture from the Donnelly Group , a company that's already well-known in Vancouver for its pubs and barbershops . 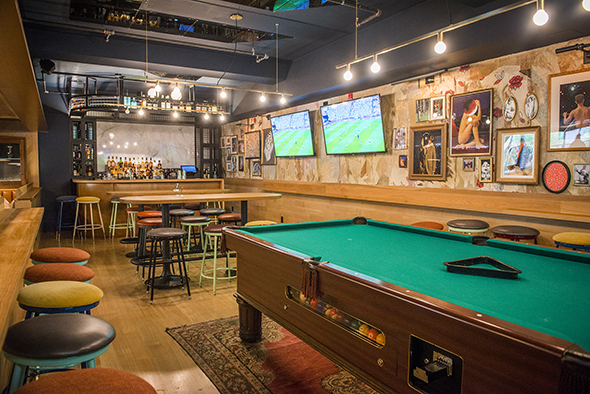 The massive, almost 400-seat, multi-room watering hole has all the essentials, including beer, whisky, at least a dozen TVs, billiards, group seating and most importantly, a convivial vibe. 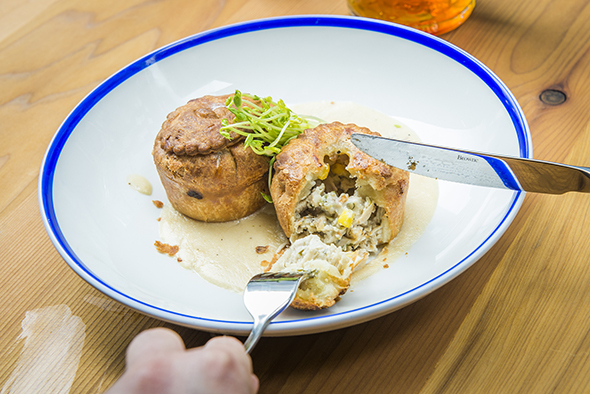 The menu of pub grub will satisfy almost any craving. 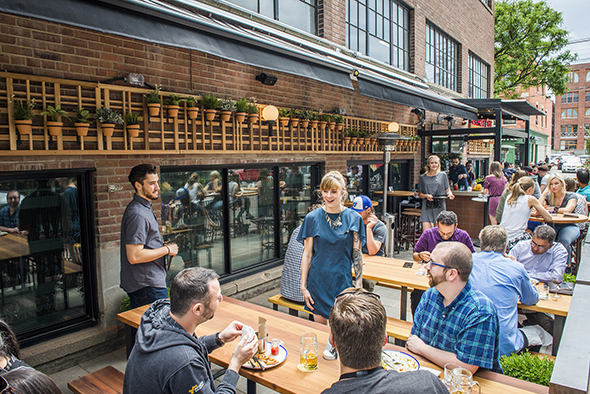 There's currywurst ($8), wings ($12) and chicken pot pie sliders ($12) to start, followed by a selection of pizza, sandwiches, salads and other pub staples. 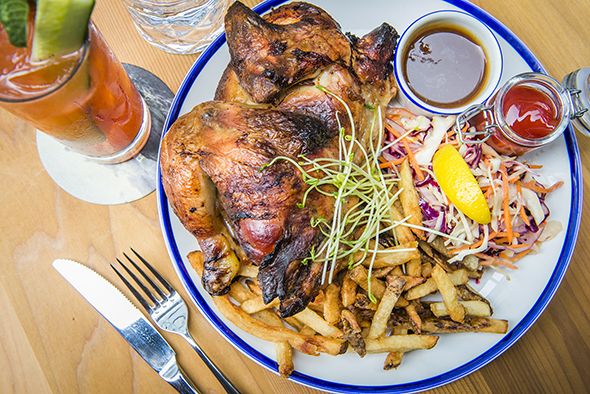 The rotisserie chicken ($16/quarter, $20/half, $26/whole) is a welcome feature with commendably crispy skin. Fries, roasting jus and slaw are included on the side. The burger ($16) on a brioche bun doesn't disappoint either. 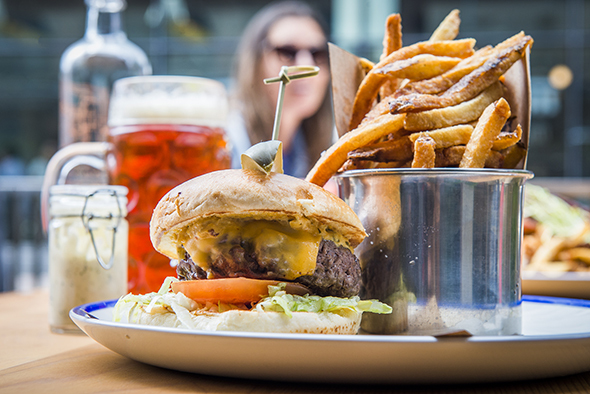 The house-ground patty is thick and juicy with a slightly rosy centre. Toppings are tried and true and include American cheese, iceberg lettuce, tomatoes, mustard and mayo. 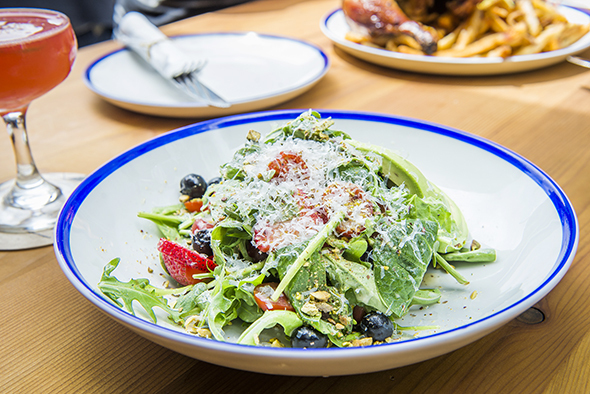 On the lighter side, the summer greens salad ($14) offers a medley of avocado, berries, cherry tomatoes, pistachios, spinach and arugula tossed in a citrus vinaigrette. The option to add on a roasted chicken breast for $6 makes it an appealing entrĂŠe. 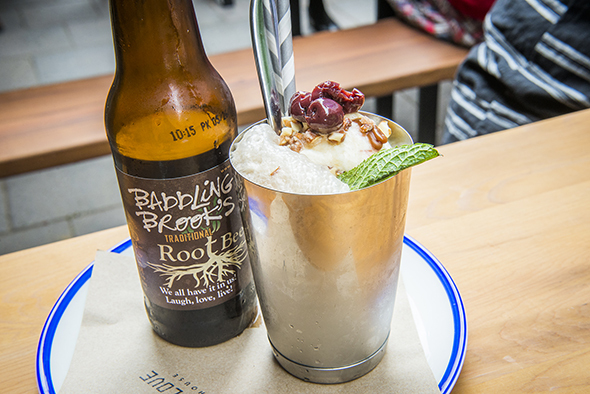 For dessert, you can grab a float ($8) made with Lick It Gelato and Nickel Brook root beer dressed up with dark chocolate fudge, cherries and almonds. 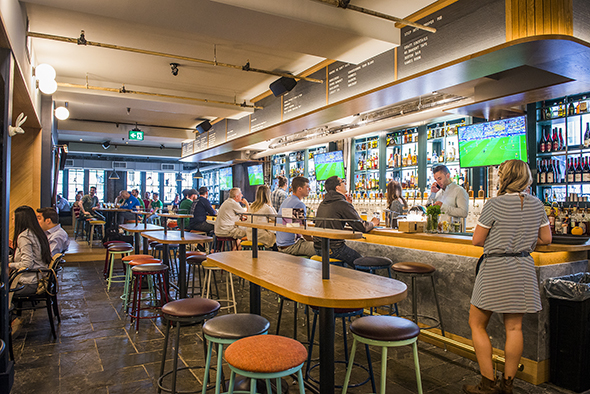 In the evenings and on the weekend, the neighbourhood's condo dwellers will surely appreciate the brunch menu, not to mention the three bars on premise, including one on the 100-seat patio. The main bar inside devotes itself to beer and cocktails. 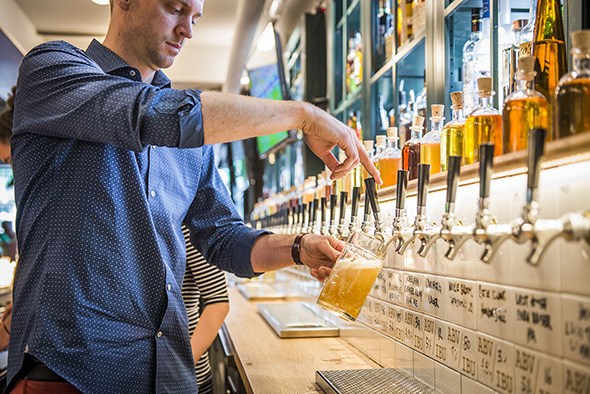 The selection on draught (from $6.25/16-ounce) is dominated by Ontario craft brands. 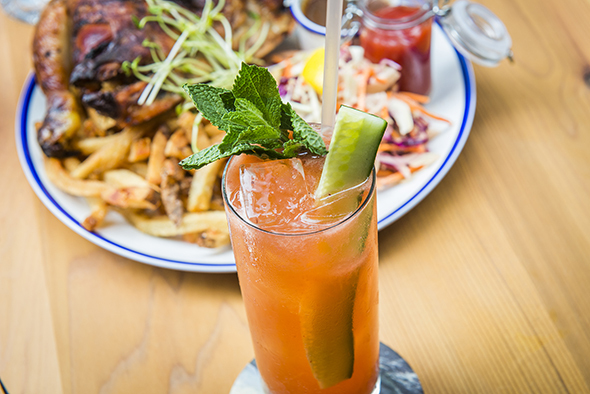 Featured cocktails include appropriately summery refreshments like the P.S I Love You ($12), a take on a Pimm's Cup blended with strawberry juice and loosened up with ginger beer. Meanwhile, the whisky bar in the games room showcases a collection of bottles hovering in the triple digits with more always trickling in. Regulars can buy a bottle (and write their name on it) and store it on site until they return.